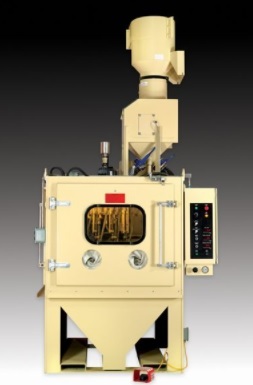 Like other sandblasting equipment, these devices are used to remove coatings, roughen smooth surfaces, smooth rough surfaces, etch, carve, degrease, deburr, peen, deflash and descale a number of surfaces made of metal, wood, plastic and glass. Unique to shot blasters utilizing beads is the ability to decrease tensile strength while imparting compressive residual surface stress by dimpling the substrate, significantly improving fatigue strength. The use of rounded beads is crucial to this effect as the use of angular and sharp-edged grit blasters, though effective at cleaning and resurfacing, does not result in these particular material advantages. Automotive, shipbuilding, electronics, construction, agriculture, industrial cleaning and processing, aerospace, decorative design, woodworking and glass industries all make use of the versatility provided by bead blasting equipment. Bead blasting significantly increases longevity of engine components such as gears, shafts, housings and turbine blades and improves the quality of various industrial components such as nuts, bolts, printed circuit boards, ships, bridges and building components. While traditional sand and grit blasters can be used in these applications, bead blasting is a rapid and dust-free process that minimizes the health risks associated with silica dust inhalation. Though specific machines may differ, most bead blasters have a similar construction. An air compressor is connected to a power source as well as a hopper or vessel containing abrasive beads. Hoses of varying length connect the hopper to a shot blaster gun. The gun and nozzle may be contained in a blast booth or cabinet if the beads are to be collected for reuse and if size permits. Pulling a trigger or pressing a switch causes the air compressor to push air through the gun creating a vacuum; this vacuum pulls the abrasive beads through the tubing and out of the nozzle at the end of the gun in a high pressure stream directed towards the surface to be cleaned or resurfaced. The materials of both the object and the beads should be carefully considered along with flow rate and blast pressure. Additionally, the size of the beads is often variable depending on the needs of a given application as well as manufacturing techniques. Abrasive beads made of plastics, ceramics, glasses and metals such as aluminum oxide, silicon carbide, acrylics, aluminum, brass and bronze can be produced in a number of ways. Common processes which produce the spherical implements used in shot peening equipment include slip casting, pressing, injection molding, extrusion, spherical grinding and spherical lapping. Bead Blasters Bead blasters utilize high pressured streams of spherical abrasives to clean or otherwise resurface parts and components in industrial, commercial and domestic settings.